Looking for a Ibiza beach? From secluded pebbly coves to vast sandy bays, every Ibiza beach is renowned for its crystal clear sparkling waters and unique natural settings. Below you can find a list of our favorites beaches and “calas” that we have personally tried and verified… each Ibiza beach listed below has been “tested” for you! Nearby these listed beaches, with the help of the Team of Ibiza Rent you can find your Ibiza Beach House! One of the island’s most rustic Ibiza beach, Cala Salada remains relatively uncrowded and tranquil due to its off-the-beaten-track location through a pine forest, down many steps. Despite the Ibiza beach proximity to the bustling resorts of San Antonio, it is still overlooked by tourist ferries and buses. This Ibiza beach is popular with local young families and mature couples, there are some tourist facilities, but this Ibiza beach remains pretty basic. Cala Saladeta can be spotted from the neighboring bay of the neighbor Ibiza beach Cala Salada, but getting there is a just a wee bit of a challenge in the peak of summer – be prepared to clamber over the rocky divide! The result is well worth it, when you arrive at the smaller, quieter Ibiza beach with amazing snorkeling opportunities. In this Ibiza beach there are no tourist amenities or chiringuitos, so pack a picnic and enjoy the chilled out vibe! The gorgeous, sandy Ibiza beach of Es Figueral is punctuated by rocky inlets and cliff-faces carved by wind and sea. The soft white sand and crystal clear shallow waters make this Ibiza beach a fab choice for families, while snorkeling enthusiasts will rejoice in the nooks and crannies offshore. Watersports are also popular in this Ibiza beach, due to the water conditions… a Ibiza beach for all occasions! Please contact us to find a Ibiza House nearby this Ibiza beach! One of our favorite Ibiza beach on the north of the island, Cala Xarraca is almost a well-kept secret… until now! This picturesque Ibiza beach boasts crystal clear water and this small Ibiza beach – you’ll feel as though you’ve stumbled onto your very own private Ibiza beach! Surrounded by lush, green forest areas and rocky pathways, this Ibiza beach also features natural mud baths… come to see this Ibiza beach! Playa de Cala Conta is a Ibiza beach which lies nestled among tiny rugged coves in the San Antonio area to the east of Ibiza. This Ibiza beach appears almost by accident after a winding drive through the unexpected greenness of the island’s interior. Surrounded by sand dunes and rocky cliffs, the cove is incredibly still and sheltered. The crowd is effortlessly bohemian, with a mix of all nationalities, young and old alike. As one of Ibiza’s most distinguished sunset spots, don’t head home until long after dark! Presiding at the bottom of a rolling green hill, just like the pot of gold at the end of a rainbow, sits Cala D’Hort, one of Ibiza’s most magical and laidback beaches. The arc-shaped golden Ibiza beach boasts uninterrupted front row seats to one of Ibiza’s most beautiful natural spectacles, the island of Es Vedra, a rocky limestone formation jutting out of the sea as if it were superimposed on the water. One of the most magnificent Ibiza beach, Cala Tarida is the longest and widest beach of fine white sand on the island’s west coast. Famous for her beautiful blue, turquoise and emerald green waters, Ibiza beach Cala Tarida’s sandy shores have a bit of something for everyone – including beach volleyball, water sports, and even a diving school. Please contact us to find a Ibiza House nearby this Ibiza beach! Cala Nova may well be the best Ibiza beach for surfing! While not quite in the same league as the South Pacific for gnarly waves, when the brisk northerly wind picks up, the beach is regularly home to Ibiza’s surfing community (albeit known more for bodysurfing than the stuff of Quicksilver adverts…). This Ibiza beach boasts powdery golden sand and is long enough to provide ample space to spread out and picnic. 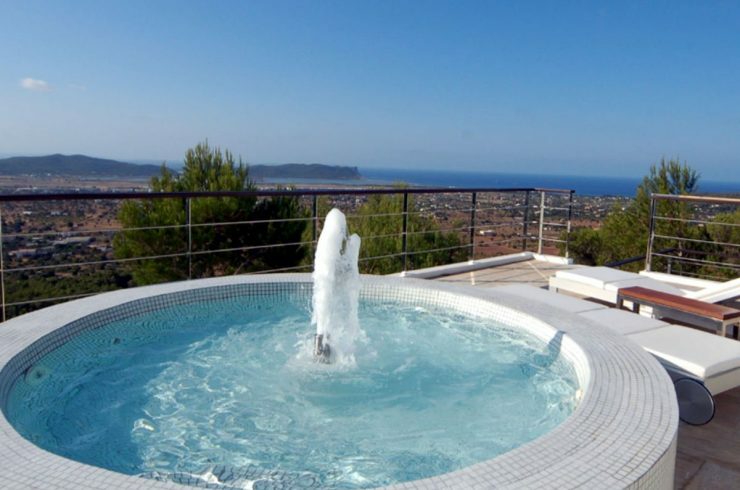 With scenic views over the rocky red cliffs and pine forests, this setting is characteristic of Ibiza’s east coast. One of the most talked about Ibiza beaches, as much for the atmosphere as for the scenery, Benirras is a medium sized beach with rocky, grainy sand and almost unbelievably clear water. As you drive down the winding road leading into the valley where the bay opens up, you’ll see the regeneration of thousands of fragrant pine trees – which were destroyed by a devastating forest fire in 2010 – a symbol of hope for Benirras to retain its beauty in the future. From San José, drive over the island’s impressive, sparkling salt flats to Ses Salines. This sweeping 2km arc of pale sand provides a more low key alternative to pumping Playa d’en Bossa, but offers plenty of seaside glamour with a variety of St Tropez style beach clubs where the jet set and yachties dock for a spot of lunch with a side of house and electronica. From this Ibiza beach you can also look out for the vibrant “parades”, which pass several times a day (whereby the likes of Pacha and Space send throngs of dancers, drag queens and general party people to drum up a buzz around the biggest events happening that night). Please contact us to find a Ibiza House nearby this Ibiza’s beach! Clocking in at three kilometres long, Playa d’en Bossa is the longest Ibiza beach and also one of the most famous. The soft, pale sand is scattered with sun beds throughout summer and blissfully vacant in winter – offering residents the best of both worlds. An array of Ibiza beach bars, boutiques and restaurants – growing bigger and better each year – keep the beach busy until well after dark, often with DJs spinning Balearic beats, while the promenade provides the perfect place for people watching. A long stretch of dark golden sand dominated by striking rocky cliffs, Aguas Blancas is one of the few ‘official’ naturist Ibiza beach (you can get naked in every Ibiza beach with no problems). This Ibiza beach is a picture perfect example of Ibiza’s unspoiled northeastern coast. The turquoise waters of this Ibiza beach are reasonably shallow and great for swimming, with plenty of caves and rocks to explore if you dare. When the wind is up, foamy white waves lap at the shore hence the name, translating to white waters. This sweet little Ibiza beach is surrounded by cliffs and is one of tiniest Ibiza beaches. Because Cala Mastella is a relatively untouched and unspoiled Ibiza beach, it retains a very special bohemian-like vibe. The base of the sea is a bed of stones, meaning it’s advisable to purchase some waterproof rock shoes to make your entry into the water easier – the beauty of these stones however, means the calm waters remain completely clear, making Cala Mastella the perfect Ibiza beach to snorkel. Located north of the craziness of San Antonio, and a little further north still than her big sister beach Cala Gracio, Cala Gracioneta is a real find. A beautifully small bay, with clear sparkling waters and sunset views, it also has the privilege of being the location for El Chiringuito Gracioneta, owned by Javier of Mambo and Villa Mercedes (amongst a myriad of others). Please contact us to find a Ibiza House nearby this Ibiza beach! 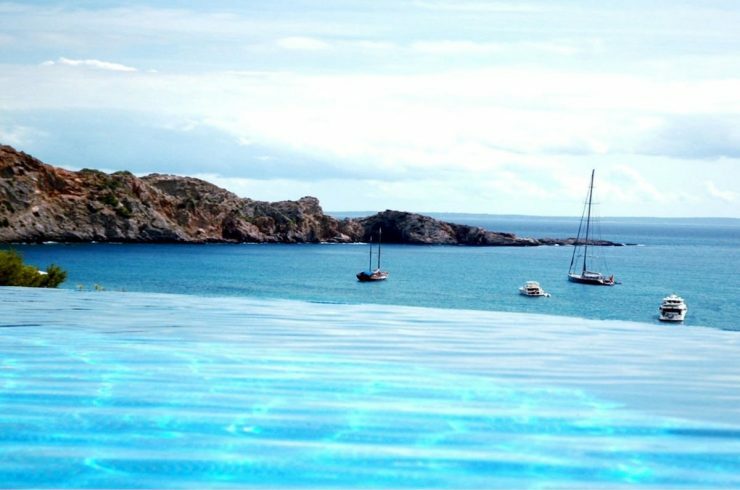 This Ibiza beach is a tiny secluded cove surrounded by rocky cliffs and lush green foliage. Park yourself on a sun bed on this Ibiza beach, or get explorative and swim and snorkel around the rocky bay to check out hidden underwater caves. The water’s edge at S’espanyol Ibiza beach is made up of hard pebbles, so use the long plank leading in to avoid hurting your feet. Once you’re in, this Ibiza beach’s water is crystal clear and always with a perfect temperature. 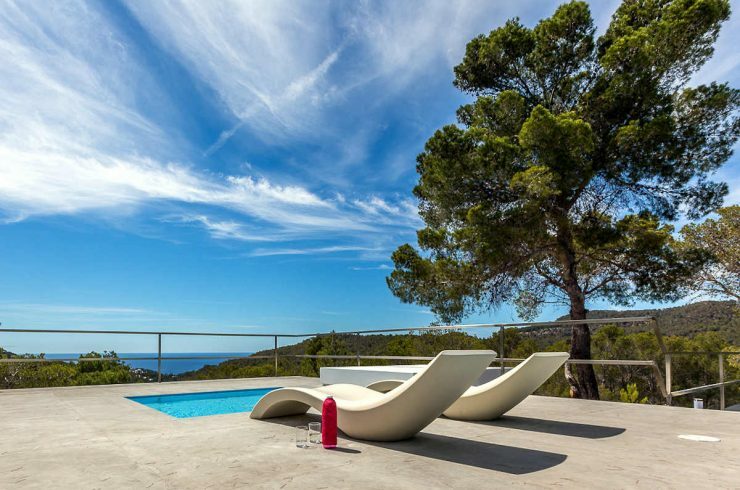 Cala Bassa boasts some of the clearest, cleanest water you’ll ever see in a Ibiza beach and the softest golden sand. This Ibiza beach will make you think you’ve escaped the Med and made it to Maldives or Thailand. Large rock formations on either side of the Ibiza beach are a constant reminder however, of the rocky and rustic terrain of Ibiza. To discover this hidden paradise, enter along a wooden walkway between two rustic, red cliffs – it literally feels like stepping into another world. The soft golden sand, clear blue skies, sparkling sea and a rocky headland (where you’ll find plenty of nudists!) keeping Sa Caleta protected from the wind await your arrival. Please contact us to find a Ibiza House nearby this Ibiza’s beach! 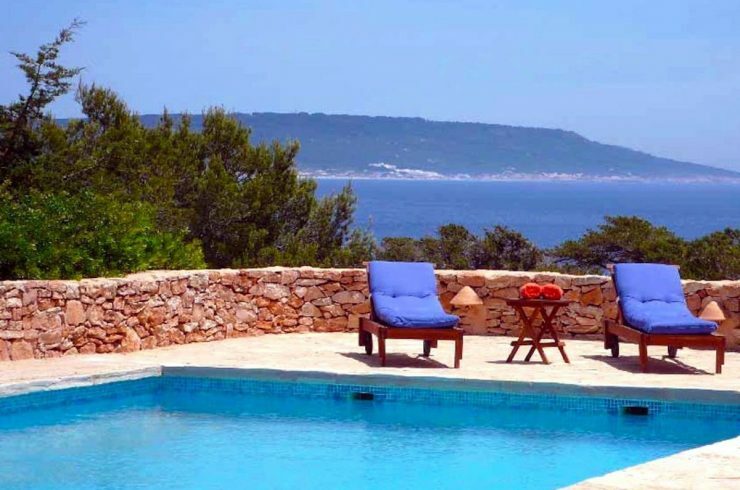 This Ibiza beach is the pretty little sister to next door neighboring beach Cala Gracio, Cala Gracioneta is a quaint, rustic cove on Ibiza west coast that’s small in size yet packed with character. This Ibiza beach is surrounded by plenty of shady trees, rocky headland and a golden patch of sand extending all the way back to the chiringuito. One of the most breathtaking sights to behold in a Ibiza beach, Punta Galera is an amazing bay surrounded by stone formations jutting out from the cliffs like large, flat shelves. Beneath the rocks, the sparkling azure Mediterranean Sea glistens, beckoning sunbathers to cool off by diving off the rocks, while surrounding rock pools prove popular with snorkelers. A truly unique Ibiza beach experience that shouldn’t be missed!